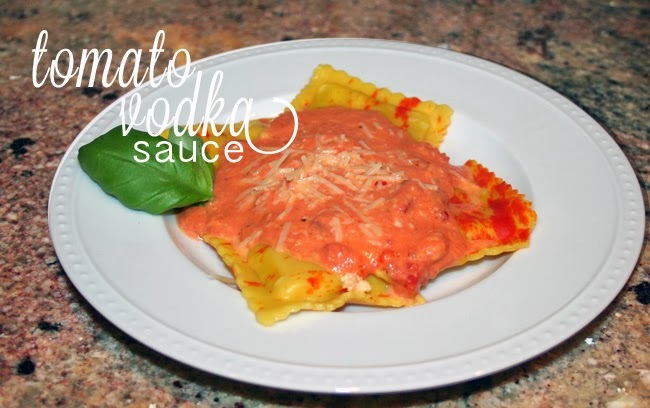 When I first heard about tomato vodka sauce, I thought... probably not for me. I was afraid you would be able to really taste the vodka, which does not sound appealing when paired with pasta (paired with tonic and lime... well, that's a different matter). I gave it a shot and now... I insist that you do too. It's so easy and makes for a really nice and fast dinner for company. The sauce cooks up really fast, so you can spend more time entertaining your friends with all those lame photos from your last vacation. Right? In a large pot of boiling, salted water, cook the pasta until al dente. Meanwhile, heat up a large saute pan over medium heat. Once heated, add the vodka and red pepper, simmer for 2 minutes. Add tomato puree and cream; simmer for 5 more minutes. Season with salt and reduce heat to low. Add the cheese and stir thoroughly. Pour the sauce on top of your cooked pasta. Serve at once. *I have made this sauce ahead of time just stop before adding the cheese. When you are ready to serve, simply heat up the sauce and add the cheese. I made this one year as Christmas gifts to our neighbors - I jarred up the sauce ( and gave it with the pre-measured parmesan cheese and noodles. So easy because you can make it in big batches!